I made this awesome purse for someone at work. I loved this bag and almost almost regret selling it because I loved it so much. She didn’t like my original design colours (grey and something) and then started asking for red/black or vibrant colours and it needed this and needed that and I was like okay nevermind I am so not making you a purse anymore……I don’t like people infringing on my creative process. So after much thought and sifting through my fabric stash I found this red and black awesomeness and received some free stash from M that I used for the liner. 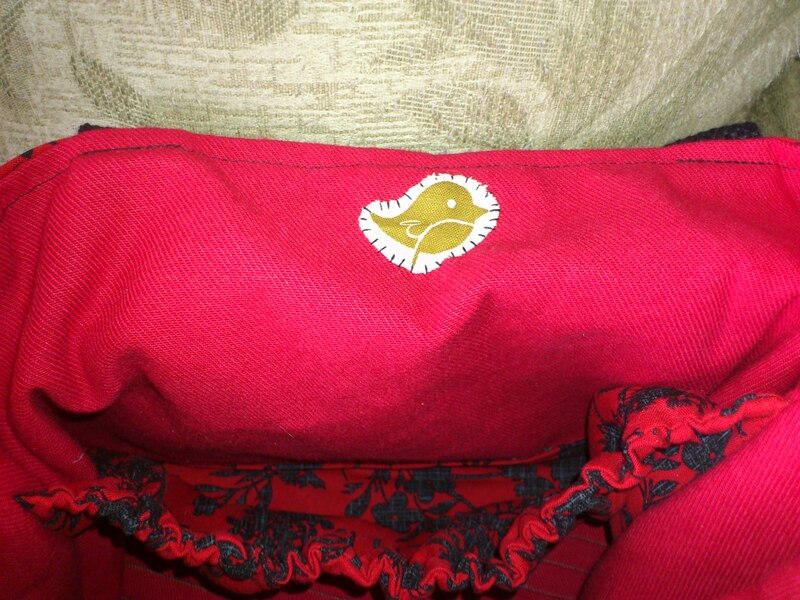 It was a nice heavy fabric that gave the bag a nice weight and made it “more winter/cold weather friendly”. I also used some of the wool from my old winter coat for the bottom, sides and button clasp as well as the button, it came from the coat also. You like the little bird right? I use them on all the projects I am really proud of they also came from M’s stash way back in the day. The end result was simply fantastic. 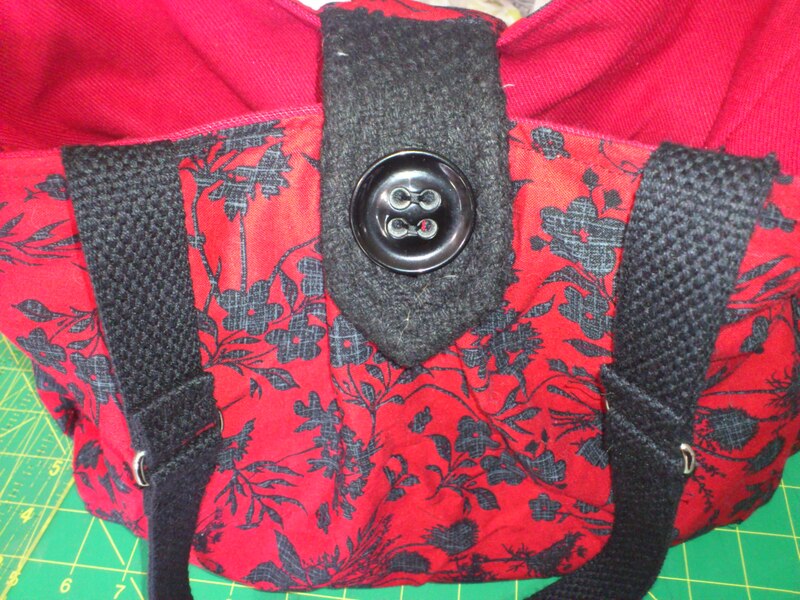 One pocket on the inside running the length of the bag, a pocket on either end all with elastic tops to minimize things from falling out. Button closure. Two medium length straps perfect for keeping the bag under arm or to hang at a reasonable height from your elbow. Seriously I loved this creation. if it doesn’t smell like teen spirit I don’t want it. 1992 Chev Cavalier, 6 cyl, standard, two door, faded red. Must have power locks, power windows and a cigarette burn in the roof liner fabric on the driver’s side. Should smell like teen spirit. Anytime my current car breaks down I think about that car. Like now. On Saturday the fuel pump in my car decided it no longer wanted to work. So I did what I always do. I called my brother the mechanic. I sat around for half an hour waiting for him to show up and fix it. He showed up but he didn’t fix it. What did he do? Well he…. Nosed around under the hood some more. Looked under the hood some more. Left to buy gas and put some in the tank. Tried to start it again. Told me he was going to give me a ride home. I went home cold, wet and dejected. and I once again started thinking about that old red Cavalier. Not that it didn’t have its own problems but they were minor and far between and it was essentially my first car. (even though I didn’t pay for it, it wasn’t in my name and I never once paid the insurance.) I LOVED THAT CAR. I taught myself how to drive stick by going back and forth in the drive way for 20 minutes to get a grip on 1st and reverse, then proceeded to take it out for a 3 hour joy ride – I only stalled once but it happened to be at the only light in a one-horse town. I once had to drive it home from Toronto without 5th gear. I had also lost the reverse at that time. Parking at school that week was a nightmare, trying to find a spot I wouldn’t have to back out of! For whatever reason, that car was just really well made and never failed me until the clutch went and my dad refused to fix it so I was spoiled. No car will ever live up to that one. Maybe I should stop trying to compare them…. to make more blankets like this. I’m very happy with how the back turned out. I’ve never tried to incorporate blocks on the backing before. it always looked so difficult it scared me but I bit the bullet and just went for it. I kinda like it! I totally love the edging on this. I made up one extra strip and then cut it into 1.5 inch sections, sewed them together in a repeating fashion. It turned out fantastic. I am very proud of this blanket. Its the first project that doesn’t have some “major” newbie flaw in it. It makes me feel like I’m actually improving! I like it! They were playing at every craft show my mom and I hit up this weekend. I love craft shows but wow I feel like this year is just flying by. maybe its the anticipation of all the things I’ve had and have going on this year surgeries, illness, milestones, new words, and new babies expected! so to have Christmas not so much sneaking up on me but flying towards me as if on a bullet train… I start hyperventilating. and then I start spending money which brings us full circle to the craft shows. thankfully I don’t attend the craft shows with the intent to buy them out its just something my mom and I do. as often as possible. Step one, cut a million little squares and sew them to larger squares. Step 2 cut all the corners off. And this is partially what it looks like put together. Maybe tomorrow I will get to post the finished top but don’t hold your breath.